The Nation: Banking on Chalabi Ahmad Chalabi, the notorious Iraqi who pushed America to topple Saddam Hussein, has finally obtained what he has sought for so long: an official role in the government of Iraq. Aram Roston says after pulling for the US invasion, the poor showing at polls still was enough for his seat. Iraqi Deputy Prime Minister Ahmed Chalabi speaks at a media conference with the members of his electoral list. 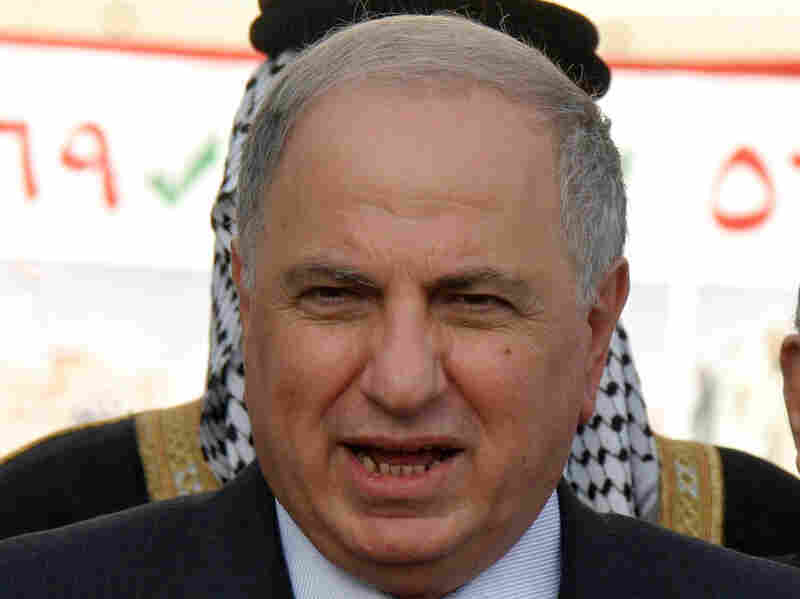 The energetic Ahmad Chalabi, the notorious Iraqi who pushed America to topple Saddam Hussein, has finally obtained what he has sought for so long: an official role in the government of Iraq. After seven years of drumming his fingers together in the wake of the US invasion, in spite of a poor showing in the polls in the March 7 elections, Chalabi will have a seat in Iraq's new Parliament. After all the damage done by Chalabi, who has virtually no constituency in Iraq, why does he have any influence at all? True, there is his sheer skill as a political fixer and influence peddler. He continues to wield power as chairman of the Accountability and Justice Commission (the new name for his old De-Baathification committee, set up soon after the US invasion). And as American officials have acknowledged, he has close ties with Iran and its Revolutionary Guard. But according to several Iraqi businessmen and American officials, another key to Chalabi's resurgent influence--one that has received far less attention from the news media--is his connection to Iraq's banking sector. The man whose organization, the Iraqi National Congress, received tens of millions of US taxpayers dollars in the run up to the Iraq war--and who was convicted in a massive bank fraud case in Jordan--is believed to have immense influence over banking in Iraq today. The first place to look for Chalabi's touch is the Trade Bank of Iraq, which handles virtually all international purchases made by Iraq's government. By 2008, it was a $10 billion operation. Though it is owned by the government of Iraq, it operates independently as a commercial bank. Ahmad Chalabi handpicked its president and CEO back in 2003, nominating his grandnephew, Hussein Al-Uzri, who had spent years in various Chalabi family businesses. Then-US viceroy Paul Bremer confirmed Chalabi's choice, creating the Trade Bank with a stroke of his pen, and Al-Uzri has stayed tenaciously in place through the tenures of three prime ministers. "If you got me a job," said one American banking official in an interview, "I'd be loyal. Wouldn't you? I don't think I need to point out to you how important family is in the Middle East." Iraqis and American officials say it is widely believed that Chalabi has at least some influence over the bank. "You can infer control," the American official explained, acknowledging that such inferences do not amount to proof. Of course, it is possible that Chalabi maintains a hands-off stance, and avoids all talk about business with his grandnephew when they meet. But even if he does, businessmen are well aware of the connections. And the perception itself is important. The man who runs TBI wields great influence over Iraq's government ministries because the bank has a monopoly on issuing letters of credit for the government (except on military items). It is the only place to go for any Iraqi Ministry that needs to purchase goods overseas: wheat, generators, soap, fertilizer or medicines. That means the bank, if it so desired, could easily ask for political favors in exchange, bank experts and businesspeople say. Unlike most banks that issue letters of credit, TBI requires that its customers--the various ministries in Iraq--deposit the entire value of the letter in the bank. That deposit stays there until the transaction finally goes through. So a huge chunk of Iraq's oil revenue must pass through the bank. But when the letters of credit aren't used, it is unclear that the ministries' cash gets refunded. A group that monitors Iraq's oil revenue, the International Advisory and Monitoring Board, has questioned whether there was adequate accounting for all the money that Iraqi ministries had deposited with TBI, pointing to "weak coordination" and the absence of "proper reconciliations." TBI says its books are in order and if there have been failings in the past, they are being corrected. And a TBI spokesman said Uzri's family connections are irrelevant. "In the past, the security situation made it impossible to carry out totally accurate procedures in some aspects of the audit, as our last annual report made clear," TBI's Zaid A. Mahdi told me. "As normality returns, our procedures are being progressively brought up to the best international standards." Looking at TBI's annual reports, it is hard not to be mightily impressed by the bank's astronomical growth charts: a jaw-dropping 2,300 percent increase in assets from 2004 to 2008, from $414 million to $10 billion. Or a 23,000 percent increase in deposits in those same years. As cheery as that all is, auditors at Ernst & Young cited "weaknesses" in internal controls, and hundreds of millions of dollars in unreconciled accounts at the bank--basically a failure to balance the books. The lobbying firm would not explain details of what it does for TBI, other than the boilerplate language it put on its filing at the clerk of the Senate: "issues related to Trade Bank of Iraq's role in establishing a stable financial system in Iraq and ensuring flow of capital." Meanwhile, the Al Bilad Islamic Bank was opened in 2006 by none other than Hussein Al-Uzri's father, Isam Al-Uzri. Sources say Chalabi is believed to have influence here as well. At least one more of his relatives is also involved. Intriguingly, another shareholder is the man who used to run the operation through which Chalabi filtered much of the bogus intelligence and propaganda that fueled the rush to invade Iraq, the US-funded Information Collection Program of the Iraqi National Congress. That shareholder is a Chalabi aide named Aras Karim Habib. He has long been a suspected Iranian double agent. The Al Bilad Islamic Bank has also had rather extraordinary growth. Iraqi and American government officials say it is very close to the Islamic Supreme Council of Iraq (ISCI) movement. They have been tracking money flows to Lebanon, through the bank, from Iran. "Al Bilad Bank," the American banking official told me, "is for all appearances a Chalabi bank. It was created because they figured that eventually someone would complain about what was happening at TBI." It seems evident that the Uzris, son and father, both tied to Ahmad Chalabi, maintained their relationship while in banking. Indeed, the ties between the banks were celebrated by a trade magazine, which gave Al Bilad Islamic Bank an award for "Deal of the Year" in 2008 for its alliance with TBI. TBI, the state owned bank run by Hussein Al-Uzri, gave Al Bilad Islamic Bank run by Al Uzri's father a $100 million letter of credit reissuance deal for the Iraq government. The TBI spokesman says that Al Bilad did not get special treatment. Chalabi didn't return repeated requests for comment through his longtime associate Francis Brooke, and e-mails to al Bilad Bank officials received no response. In the end, whether Chalabi gets a seat in Parliament or not, as usual the best way to understand him, and sometimes to understand Iraq as well, is to follow the money.